WHAT, WHEN, WHERE: Thursday, October 8 from 6pm to 9pm @ New York Hall of Science (47-01 111th St., Flushing Meadows Park). Directions and parking information here. 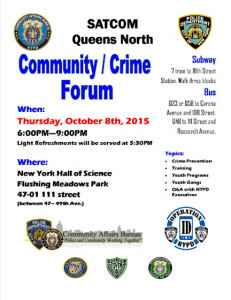 The October 8 meeting includes a Q&A with NYPD executives and information about the SATCOM—strategic and tactical command—initiative, which is an effort by police to work with community volunteers to address crime prevention, training and youth programs in the precincts that comprise Patrol Borough Queens North. For more information you can call the 112th Precinct Community Affairs Unit at 718-520-9321.